We ride through Belize and Guatemala on our way to South America, encountering our toughest road yet, gear failure, and more. We left our airbnb in Chetumal early in the morning, and headed the short distance to the Belize border. After getting our passports stamped out, we had to have our TVIP cancelled and refunded. They inspected our bikes and checked the VIN #'s, then gave us the receipt and we were on our way to Belize. The first thing we encountered as we rode through the concrete corridor was a fumigation station. The workers there seemed surprised/annoyed at our presence, as they had to haul out a generator and spray what looked like water on our tires, then charged us $5 per bike. This seemed unnecessary, but the border guards did ask for the receipt later, so it was not something we could skip (even though we saw taxi's ignoring it). After that we followed the signs to immigration. Inside we had our passports stamped, then dealt with the slowest customs agent in the world as he eventually filled out our motorcycle permits. Once finished we drove through the border where they thoroughly inspected all documents and receipts before letting us through, and then we had to go to the insurance building and purchase insurance (a week's worth was the minimum). This process was fairly easy, and they accepted credit cards, so once that was over we were officially in Belize. We headed down the road towards the town of Orange Walk, only to watch the skies open up and dump rain on us harder than we've ever experienced. We noticed that no businesses seemed open. No hotels, grocery stores, etc. We assumed it was because it was Sunday. But we later learned that a Chinese grocer had been shot in Belize City, and as a form of protest all the Chinese owned businesses in the country shut down. We did manage to find a small restaurant for lunch, and we tried to wait out the storm there. But after a while it became apparent the rain wasn't going to stop, so we toughed it out and continued on. It was slow going, but at least there weren't many other vehicles on the road. 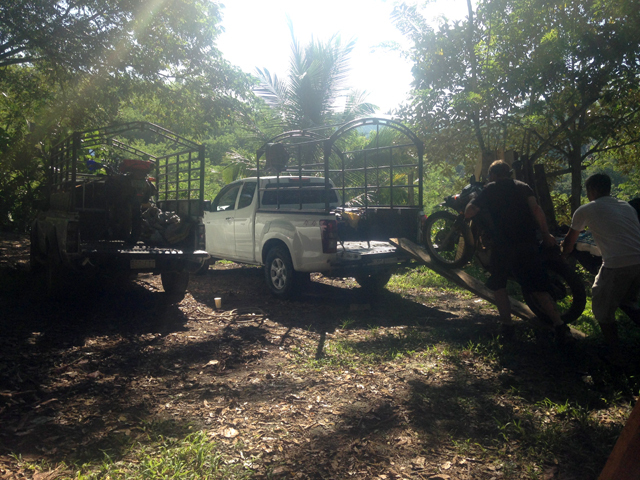 We originally planned on staying in Orange Walk, but since nothing was open we ended up riding over 200 miles that day and finally stopped in Belmopan. We had to ride around for a while to find a hotel that was both open, and affordable, but we finally did. The next morning we set off early to Hopkins, a small town to the east on the beach. Because we only had 60 miles to go, we arrived in Hopkins early and checked into our hostel, the Funky Dodo. We did some much needed laundry and checked out the beach and the small town, which was quite cute, but a lot of the restaurants and shops were shut down for rainy season, so we decided to head to San Ignacio the next day before crossing the border into Guatemala. San Ignacio was only 80 or so miles from Hopkins on the other side of the country, so once again we arrived in town fairly early. We had an…interesting…time in San Ignacio. First, our hotel did not have the "secure parking" that it had advertised on booking.com, instead we were told that we needed to park in the public parking lot during the day and move our bikes into the shop downstairs at the end of business. While we were unloading our bags a man on a bicycle approached us and told us that he was an employee of the hotel across the street and that we could park in the garage since they were a "sister" hotel to ours. We found this somewhat suspicious since he was not wearing any kind of uniform, but after we confirmed the situation with our hotel we decided to take him up on his offer, albeit with some worry. After settling into our room, we went and explored the town and found a place to eat lunch at a small restaurant across from our hotel. While we waited for our food we were repeatedly harassed by a clearly disturbed homeless man who kept trying to touch Johanna. After telling him off a couple times, we decided to move to a table inside, hoping he wouldn't follow. All the while, the local police watched and did nothing, clearly keeping tourists happy wasn't a priority for them. The owner of the restaurant's nephew appeared out of nowhere and punched the homeless man in the face, then asked us to buy him a beer. He proceeded to tell us about how he had spent the last 7 years in a Canadian prison for murder before being deported back to Belize. The food ended up being great, but the atmosphere was less desirable. We couldn't wait to hit the border the next day. Luckily we had a fairly easy border crossing into Guatemala and found ourselves at our hotel in the small town of El Remate in no time. We spent the night just off Lago Peten Itza and then headed 30 km north to visit the ruins of Tikal, which interestingly is pretty near Calakmul on the other side of the border. According to archaeologists the two were rivals and fought each other quite often. Tikal was pretty nice, but more expensive than we were expecting, about 2-3 times more expensive than any ruins we had visited in Mexico at approximately $20/person. On the way back to our hotel in El Remate we were caught in the most extreme rain storm we've ever been in on bikes and we were thoroughly soaked through. We didn't think much of it at the time, but we found out later that the storm was rather serious and had caused flash floods and landslides throughout the country. Oblivious to the flash flood news since the notice email from the U.S. Embassy in Guatemala City didn't come until after we left (you get these if you sign up for STEP "Smart Traveler Enrollment Program"), we set off to our next destination, Lanquin, home of the beautiful Semuc Champey natural pools. The day started off with no complications, beyond a small delay in Sayaxche where we had to take a short ferry to the town because there was no bridge. 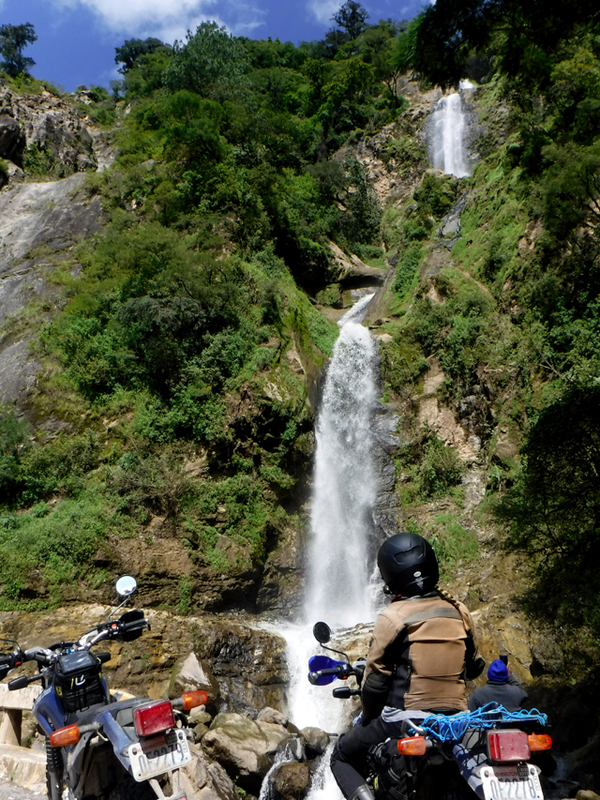 We continued another 100 kms or so onto the Ruta 5 and began ascending into the mountains. We passed a broken down tourist van that was surrounded by a bunch of backpackers who milled all over the road and slowly moved out of our way as we came through. We complained a bit through our Sena headsets about them and remarked at how we were happy to be doing a trip by bike instead of by bus this time around. We were in pretty good spirits since we only had about 60 or kms to go for the day and it was only 1:30. We rounded a corner and our nicely paved road turned into gravel which quickly turned into rocks which turned into rocks with boulders. We assumed that it would only be a few kms so we kept going instead of turning back. 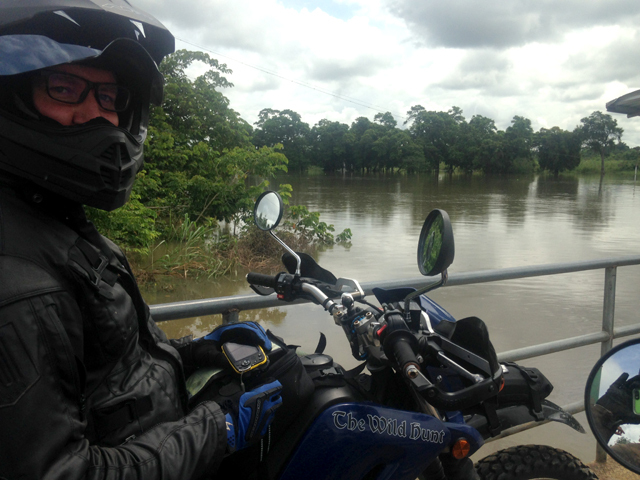 It ended up being 40 kms of the most difficult road we had ever done (especially on a fully loaded bike), and we've done 40 kms of pure mud on 125 cc bikes in Laos. It was so much worse than it looks. It took us about 3 hours to reach the small town of Campur at which point the road became a normal dirt road. We breathed a sigh of relief, we had been worried that the entire rest of the day would be that horrible road and with sunset at 5:30 we'd have to camp next to the road if we couldn't make it to our hostel. We only had about 20 kms to go, we were going to make it! We didn't make it. The next 10 kms were easy enough, but after we reached the small town of Lanquin, the dirt became mud and rocks again, and to top it off it also became extremely steep in spots. There were stone tracks set into the road on these, presumably to make the hill easier to travel, but we found that it just made them slicker. Night quickly fell and we found ourselves riding in the dark. It was not awesome. We had both fallen at least 3 times each and we as we prepared to descend yet another incredibly steep, slick hill, we began to seriously consider just camping on the side of the road instead of trying to get to our hostel, which was only 500 meters away according to Johanna's GPS. We decided to go for it and made it the 500 meters. Of course, the hostel was not there. Josh carefully climbed off his bike and asked at a nearby house if they had any idea where our hostel was, and they had never heard of it, but they knew that there was an eco-hostel, the Utopia, at the bottom of the hill. With few choices, we continued down. Josh pulled over at a side lot that he thought was maybe the hostel (it wasn't), and fell as he tried to turn around he fell again. Johanna couldn't park her bike on the steep hill, she descended with caution to the next pull off and parked so she could help Josh lift his bike. We decided to just park at the pull off and find Utopia by foot, since it was so close. We slid down the rest of the hill and found a building, but we didn't see any lights on and hoped the hostel was open. We came in through what turned out to be a kitchen, and found ourselves in the lobby of Utopia. Luckily, they were open, and the reason there were no lights is because the power had been out for 3 days due to the rain. This is the bridge to Semuc Champey where we learned it was closed. The kid on the right has too much attitude. They tried to hustle us really hard, selling water and beer for inflated prices. We had just happened to park at their designated parking lot, so we got a room and took a much needed shower and the power came back on. As we hung out in the main hang-out area we found out Semuc Champey, the main reason we came to visit the area, was closed because of how high the water levels had become, which meant we had gone through all that rough riding for no reason, grrr. We decided to stay another night in case it reopened (it didn't), at which point Josh noticed that his luggage rack had begun to crack on both sides. Not wanting to damage it further, and frankly we didn't want to travel the road back to town, we asked the owner of the eco lodge to arrange transport of our bikes to Lanquin. This kid begged us to take his picture and posed like this, then told us to pay him. We didn't. From Lanquin we continued a short ways to Coban, where we stayed the night and then headed to Antigua the next morning, where we stayed for two days and recouped a bit before we continued to Panajachel where we stayed for five days with Jessica and Greg who put us up and were incredibly gracious hosts, and helped us sort out the motley amount of issues we suddenly seemed to have with our bikes - Josh's rack, Johanna's bike stopped shifting below 3rd gear (it turns out you DO have to wash your bike sometimes) and we got a chance to give the bikes a much needed oil change. We also got in some quality dog time with their 1 year old german shepherd Moxie. Waiting with the locals for a mudslide to be cleared. On Sunday they led us to the small town of Chichicastenango where we toured the most colorful craft market in Central America, filled with stalls of various sizes selling an assortment of fabrics, figurines, fabrics, souvenirs, and more fabrics. After a few hours there we had our fill of craft markets, and likely won't need to see another for a long time. This kid really wanted Johanna to try her snot covered ice cream. After 5 great days with Jessica, Greg, and Moxie, we said our goodbyes and hit the road again, riding around lake Atitlan and down to the beach town of Monterrico. We stayed at Johnny's Place, a full service beachside resort. We lazed about the pool with a cubetazo (a bucket of beers) and had a fantastic night while preparing to hit the El Salvador border the next day. We'll try to post again in a few weeks. It was a blast hosting you in Pana and getting to know you both. Wish you all the best and hope you're road will lead you back our way for another visit!